13-May-2015 -- My final ‘Forgotten Confluence Point’ of the day was this point that had been visited only once before, in November 2000. Furthermore, this sole previous visit was in late Autumn, with snow all around, so I was looking forward to seeing what the point looked like during the Spring. I drove north along this doubletrack for about 1.5 miles, until 42.98368°N 117.01344°W, where I could drive no further. (This was about 1.3 miles southwest of the point.) I then continued on foot along the doubletrack, until it started veering away from the confluence point. 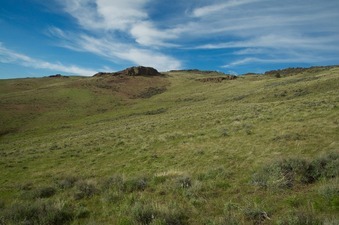 At this point - about 0.5 miles from the confluence point - I continued along the drainage, and then finally hiked up a hillside to reach the point, which lies about halfway up a grassy slope, with occasional sagebrush and lupine scattered nearby. This very scenic point deserves to be visited more often. To the north, the ridgeline is punctuated by rocky cliffs. To the west, there’s a clear view of Jordan Valley.